Here is the introduction from my blog, located at www.bobmalm.com, which gives a quick summary of my dispute with Episcopal priest Bob Malm. This blog recounts my experiences with abusive conduct on the part of my former rector, the Rev. Robert H. Malm aka Bob Malm. Bob is the rector of Grace Episcopal Church in Alexandria VA—an ostensibly inclusive Anglo-Catholic parish located in the city’s Del Ray neighborhood. 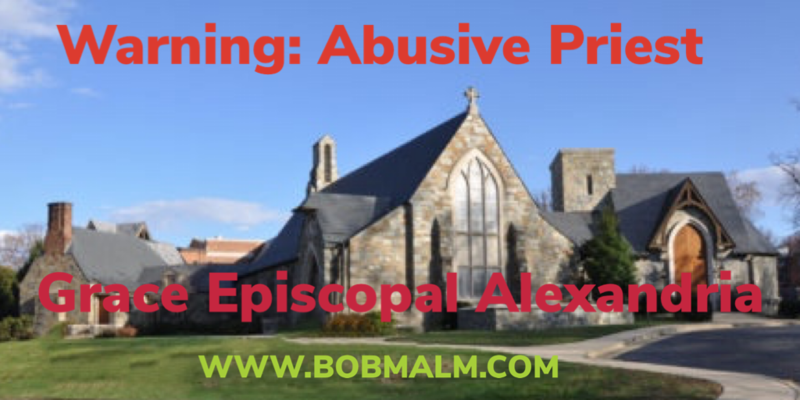 Bob’s misconduct began in July 2015, after I complained to the Episcopal Diocese of Virginia about bullying on Bob’s part, as well as questionable HR, cash management, and financial reporting practices in the parish. I also complained that parish employees were routinely experiencing workplace harassment. Four weeks later, the diocese wrote back, saying that these issues were, “not of weighty and material importance to the ministry of the church,” and declining to get involved. That’s right—the Episcopal Diocese of Virginia has no issue with bullying, workplace harassment, or church funds going AWOL. Shortly afterwards, I received an email from Bob Malm telling me to find a new church. Days later, I learned that Bob had instructed church staff, clergy and volunteers to shun us by excluding us from the life of the church. Subsequently, Bob acknowledged that he did this in retaliation for my complaint. I promptly informed the diocese, which refused to do anything. But Bob’s harassment and retaliation were far from over. Bob deliberately misused memorial donations given by my family; these were not used per the terms under which they were solicited, which is illegal. Yet again, Bishop Shannon Johnston had firsthand knowledge of this matter, and was sent written documentation that the misuse of funds was illegal, but he still refused to get involved. In spring 2017, following adverse media coverage, the bishop negotiated a ceasefire. This was short-lived, however, for the following December, Bob filed a false police report with the City of Alexandria police department, arguing that a blog written by my mother had threatened him, that the blog was mine, and suggesting that I have major mental illness. All three claims are false, and I believe Bob knows that. Moreover, in his report, Bob breached confidentiality on certain pastoral issues. Two offers from Bob to drop the matter if I would quit blogging and otherwise telling others about my experiences, thus demonstrating that Bob never actually felt threatened. Multiple lies on Bob and Jeff’s part, including claiming that I have violated the protective order, that I never served as a police officer, and that I had never been admitted to practice law. An ethically questionable effort to drag my mother, dying of COPD, into court. Remarkably sloppy work by Jeff Chiow, including ignoring rules of court and failing to proof his pleadings. Multiple lies by the vestry and others close to the situation, including the vestry saying that Mike and I left on our own, Bob Malm claiming he didn’t lie during a meeting we had with Bishop Shannon (he did), Leslie Malm falsely telling people I had admitted in open court that Mom’s blog is mine. A variety of ad hominem attacks by Lindsey Malm and others. Repeated breaches of confidentiality on Bob’s part, resulting in the bishop of Virginia taking action on one occasion. A ongoing Title IV disciplinary case against Bishop Shannon Johnston for condoning and supporting Bob’s actions. During the case, other allegations emerged involving the bishop, including that he covered up sexual harassment of a female church worker. The observation, by Mom’s attorney, that Jeff Chiow is “coming at you with a personal vendetta. In September 2018, having come to the conclusion that truth was in no way a component of Bob’s efforts, I decided to drop my appeal, instead spending my time protesting throughout the remaining 16 months of the protective order, writing about the situation, and more. In addition, I was named the #churchtoo correspondent for an international organization opposing abuse by clergy, resulting in a huge increase in awareness of my issue. Meanwhile, Bob’s campaign of shunning and harassment, which includes my husband Mike, has caused serious and lasting damage to the church. More than 120 pledging units have left the churchatatime when the church needs huge amounts of cash to maintain its physical plant. Bob is more disengaged than ever, the assistant rector abruptly resigned, and the church appears to be sliding towards insolvency. At this point, if I quit blogging tomorrow, I doubt things would get any better for the church. In summary, Bob’s behavior is abuse, pure and simple. His conduct is highly unbecoming, and reflects badly on him, on the parish, and the entire Episcopal church. In addition, Bob’s actions have been harmful to my entire family, but particularly my mother, who is in the final stages of emphysema. Her distress is palpable, and no one should have to deal with behavior like Bob’s in the final weeks of their life. Lastly, I’d point out that shunning usually is the bailiwick of cults, Scientologists, and the Jehovah’s Witnesses. Bob’s campaign of shunning me and my family will soon have gone on for two years. Such behavior has no place in any church, and suggests that Bob Malm and Grace Church are morally and ethically bankrupt. If anyone believes that his "Mom's blog" was written by anyone other than one Eric Bonetti himself then please private message me regarding a bridge that I have for sale. 1. Mom has stated in writing it is hers. And IP records clearly show it has not been updated from Northern Virginia or any location associated with me. 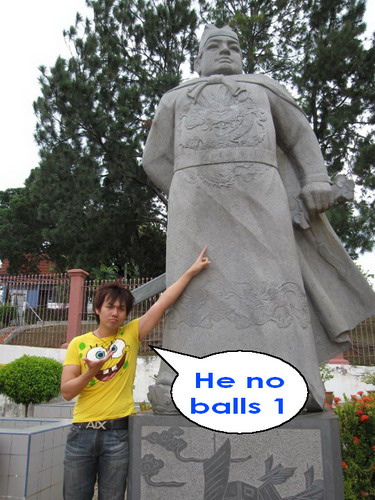 Moreover, Mom has made that statement against interest with the full knowledge that Jeff Chiow continues to falsely claim that her comments are defamatory. Speaking of, what kind of man or priest goes after Mike, who had been received into The Episcopal Church only 16 months earlier? Answer: A bully, coward and ballless wonder. And a fake priest. Speaking of lying, Bob also said under oath that, to his knowledge, only his wife Leslie has blogged about this issue. We all know that was a lie: Per the Alexandria police department, Lindsey Malm has too. Nothing like a little priestly perjury, eh?